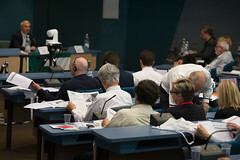 The XXV Congress of the Union of European Federalists was held in Strasbourg. The event marked the 70th anniversary of the UEF and federalist ideas were discussed under the title: "European Future or National Decline? - Time for a Federal Europe". 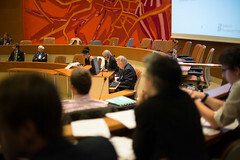 The Congress opened with a public session on Friday afternoon at the Council of Europe. Joseph DAUL, president of the European People's Party and Monica FRASSONI, co-president of the European Green Party gave keynote speeches on the future of Europe before a panel of leading federalist MEPs discussed past, current and future federalist strategies for building a democratic and federal union for Europe. On Saturday Political Commissions were held focusing on proposed reforms of the EU institutions, the future of the European Monetary Union, the EU global strategy and European solutions for migration and border management. The Congress closed on Sunday following the re-election of the UEF President and Chair of the European Parliament Foreign Affairs Committee Elmar BROK. Should you have any further questions please do not hesitate to contact the UEF European Secretariat. This year we celebrate our 70th anniversary. It is a historic milestone and a great accomplishment. The federalist movement has never lost sight of its ultimate and visionary goal since its foundation in 1946. The UEF XXV European Congress marked the beginning of a seven-month celebratory period, culminating in December 2016 with a final event in Paris, the city where the movement was founded. To kick off the celebrations we have put together an exhibition and booklet entitled “70 Years of Federalist Campaigns for a United and Federal Europe” exploring the history of European federalism. 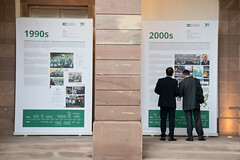 Both exhibition and booklet demonstrate how the European federalist movement has played an active role in calling for the most important developments and achievements throughout the history of the European project. You can find out more information on our 70th anniversary page. Congress participants were amongst the first to see the exhibition and join us on a journey through seven decades of federalist ideas, campaigns and demonstrations. With a mixture of historical documents, photographs and posters, the exhibition reveals story of European federalism decade-by-decade from its beginnings shortly after the war. Pictures of early campaigns and historical moments, from the first ‘euro’ coin and the frontier actions on the Franco-German border in the 1960s to the march of 100,000 people through the streets of Milan in 1985 and more recent campaigns right up to the present day, are combined with a narrative account of the history of our remarkable citizens’ movement.